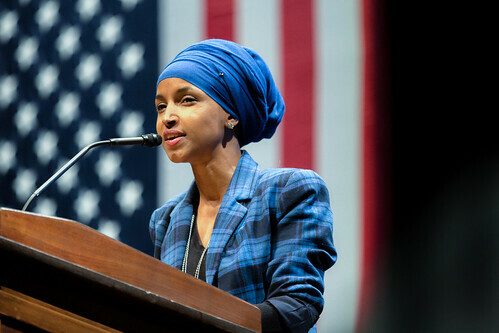 The attacks on Ilhan Omar -- one of the first two Muslim-American women to serve in Congress and the first of Black African heritage who veils -- by the Rupert Murdoch press (Fox, New York Post, etc.) and the US Republican Party are frightening for many reasons, but most of all because they repeat classic anti-Semitic charges made by the Nazis in Germany against Jews. Racism is not that complicated, and is always simple-minded and stupid, and so it is not a surprise that contemporary racists can't come up with new tropes for demeaning minorities. 1. Othering: Hitler was influenced by Austrian politician Georg Ritter von Schönerer (1842-1921), who wanted to see Austria and Germany merge into one nation. That nation, however, he held, had no place for Jews, who were not really Germans and could not really be citizens. Von Schönerer othered German-speaking Jews, and denied them the possibility of full citizenship. Likewise, those who attack Muslim-Americans like Ilhan Omar from the Right are hinting around broadly that they are not and cannot be real Americans (whom they code as white). Trump's visa ban, explicitly implemented because, he said, he believes "Islam hates us," prohibits Somali refugees like Ilhan Omar from coming to the United States and is premised on the notion that Somali Muslims can never truly be citizens of the United States in the way the Trumps are. 2. The Stab in the Back: Adolf Hitler served in the army during World War I and his eyes were hurt by gas. In the hospital, he heard the news of the defeat of Austria and Germany. He nearly had a nervous breakdown, unable to believe the news. So Hitler came up with an explanation, the "stab in the back." Germany and Austria fought well, but the war effort was undermined by the lack of patriotism of the German Jews. In fact, some 100,000 Jews served in the German army in WW I, and Hitler's charge was a crackpot notion. Ilhan Omar is being accused of being insufficiently patriotic because she maintains that you can't blame Muslims in general for 9/11; that it was the action of a small fringe group, al-Qaeda, whom she, like George W. Bush, called "people." The implication of Dan Crenshaw is that Omar is not outraged enough about the 9/11 attacks, is insufficiently patriotic, is "stabbing us in the back." Just as German Jews actually served in the German Army, so American Muslims serve in the US military, and some have lost their lives fighting for their country. And Omar's own service in Congress is a demonstration of her devotion to her nation. 3. Germs and Disease of the Nation: Hitler began calling Jews "germs" early in his political career and saw them as disease vectors that weaken the nation. This theme is related to the stab in the back, inasmuch as one way racial minorities were held by the Nazis to weaken the nation was by introducing infirmities into the national, racial stock. I don't need to go into the history of white nationalist eugenicism with regard to African-Americans, or Trump's allegation that no country run by an African had ever amounted to anything, or his epithet of "shithole" countries, directed at Africa. 4. Alliance with Socialists: The Nazis could not make up their minds whether Jews were weakening Germany because of their international banking practices as capitalists or because they were hand in glove with Communists and Socialists. You wouldn't typically imagine that there were a lot of banker communists. But they pulled it off. Likewise, the right-wing rage machine attempts to make a connection between Muslims, whom they code in general as the enemy, and liberals and leftists. Thus, an influential meme on right-wing social media held that President Obama deliberately settled 70,000 Somali refugees in Minnesota to arrange for the election of Ilhan Omar. Presidents don't settle refugees in a particular place and the meme is not true in any way. But it helps nail down the minority-socialist threat that Nazis also saw in left-wing Jews.